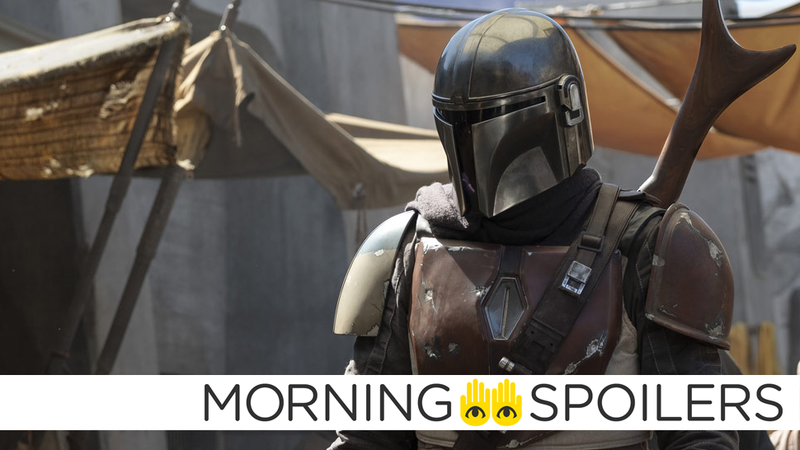 The titular Mandalorian saunters around in Jon Favreau’s new Star Wars show. Zoe Saldana offers some cryptic Avengers 4 clues. The Rock is teaming up with his Jumanji director for a wild new fantasy film on Netflix. Mädchen Amick offers a detailed take on Alice Cooper’s headspace going into Riverdale’s return. Plus, Richard Wenk on his script for the Kraven movie. Put Captain Spoilers in the cargo hold! A new rumor from The Disinsider reports Lady Gaga is Disney’s top choice to play Ursula, the Sea Witch. Speaking with Fandango, Drew Goddard confirmed there hasn’t been a sequel to Cabin in the Woods in light of the original film’s apocalyptic ending. Well, you know, we sort of painted ourselves into a corner with the ending of Cabin in the Woods. It’s not a thing that calls for an easy sequel, I’ll tell you that much. We had some crazy ideas but Joss [Whedon] and I both felt strongly that we didn’t want to do it just to do it. Right? I’m very lucky that I get to keep making movies, I don’t need to just go make a sequel for the sake of making a sequel. The only way we could do it is if we could do it justice, and the truth is, it’s a hard one to do justice to. Every version of continuing the story undercuts the ending that we had in Cabin, and I just feel like that continues to be the perfect ending for that movie and I never want to undercut it. During a recent interview with Discussing Film, screenwriter Richard Wenk revealed his Kraven film may adapt Kraven’s Last Hunt and include an appearance from Spider-Man. It’s an interesting world, a great character... it’s in the Spider-Man universe. I’m going to adhere very closely to the lore of Kraven the Hunter, and he’s going to come face-to-face with Spider-Man. I think that where we’re all circling is that this is Kraven’s Last Hunt, and whether this is the precursor to that movie, whether it will include it, we’re talking about those things. And even the idea that maybe Kraven could be like Kill Bill, basically a two-part movie. It’s all in the mix. In related news, producers Avi Arad and Matt Tolmach have revealed to Collider the Morbius movie begins filming early next year. ARAD: More or less, February? TOLMACH: Yeah, the plan is early part of next year. We’re still working on it. Legendary Entertainment has acquired the film rights to Donny Cates’ and Geoff Shaw’s comic book series, God Country. The story concerns an elderly widower who finds a magic sword inside a tornado and uses his new weapon to battle an army of otherworldly monsters. According to Nerdist, series writer Donny Cates is set to write the script himself. Producers Dede Gardner and Jeremy Kleiner have confirmed to Variety that David Fincher is still attached to direct World War Z 2. The film is scheduled to begin production next summer. Zoe Saldana teased Gamora’s return while quoting Neil Young’s Harvest Moon on Instagram. A new poster from Coming Soon tells it like it is. And here’s the new trailer, in case you missed it. Coming Soon also has a new poster for Mia Goth’s character, Sara. A new report from Discussing Film alleges that both Taika Waititi and Bryce Dallas Howard will not only direct episodes as previously confirmed, but will play minor roles in the series, too. While there are no details on Howard’s character, Waititi is rumored to voice a droid. Speaking with Comic Book, showrunner John Stephens confirmed the final season of Gotham will not include appearances by the Ventriloquist or Condiment King. Why even bother with the season, honestly? I’ve been trying to get Condiment King in for five years, but every time I pitch Condiment King, people are like, ‘We’re not going to be doing Condiment King.’ ... We were never able, at the end of the day, unfortunately, to get in the Ventriloquist, which especially for No Man’s Land feels like something we should have done, you know? But every time we wrote him in, he just kept getting squeezed out by the story, so we have Easter eggs with him in the story, obviously. However, Stephens did tease an appearance from Harley Quinn during a panel at New York Comic Con. [Jeremiah] has a somewhat deranged girlfriend, who dresses in a multi-colored fashion. I wouldn’t describe it as a healthy relationship ... She likes roller skates. Mädchen Amick offered a lengthy explanation to TV Guide about how Alice Cooper came to join a cult. [Alice] was a completely broken woman. Her entire life broke apart. Everything she had built and what she thought it was, was completely false. Because she was so broken, I think she just [latches] onto something that felt like, ‘Oh, yeah, this will heal me.’ Of course that’s not gonna be a very smooth road. It’s interesting because she’s trying to play this role that she’s supposed to play, which is, ‘I’m forgiving, and I’m open, and I’m loving, and everything’s great.’ But every time she’s tested, she goes right back to old Alice. So you see her actually like, fighting the urge of who she really is and who she’s trying to be. I think the truth lies in her Serpent past. I think her true self is a rebel. I think there’s something that happened in her childhood that really torments her, and I think that the Serpents felt right at the time. So I see her always running away from Serpent Alice, but I think her true self actually lies within the Serpents. FP and Alice are definitely keeping things under wraps, because they know it’s gonna be uncomfortable. It is a very uncomfortable situation, but you know, nobody is blood-related! So maybe there’s a very awkward moment at a breakfast table. Everybody shows up at the breakfast table, and everything’s very awkward, and nobody wants to admit anything. Spoiler TV has images from episode seven, “Lovely, Dark & Deep.” Click through for more. Miguel and Penelope hike the forest; Jane must endure David’s party; Rick doubts Lila’s intentions. Spoiler TV also has images from the Charmed reboot’s Halloween episode, “Sweet Tooth.” More at the link. Bloody-Disgusting has images of Robert Englund’s return to the role of Freddy Krueger. Head over there to see the rest. Finally, a new trailer for Kevin Williamson’s fractured fairy tale series Tell Me a Story begins with the Three Little Pigs robbing a bank and ends with a severed head crashing through a window.